I haven't painted a waterfall for ages so decided to painting this lovely autumn waterfall. Really pleased with how it turned out. 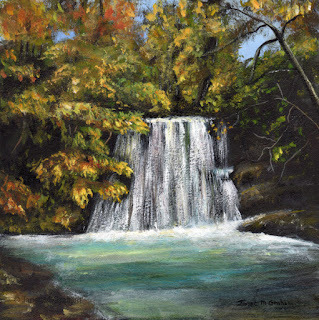 Autumn Waterfall measures 6 x 6 inches and is painted on Ampersand Gesssobord Panel. This one was a bit more tricky to paint than I thought it would be. 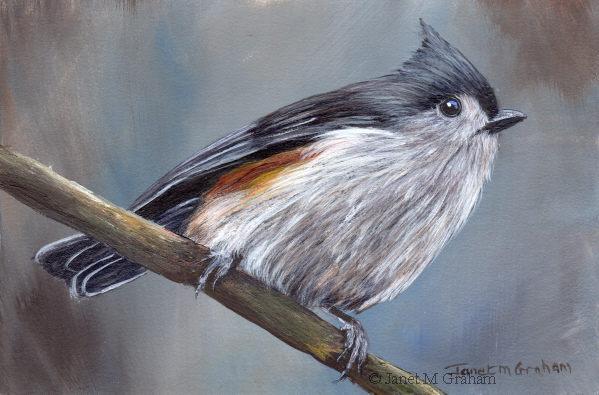 Used quite a few glazes to get the depth to the feathers. 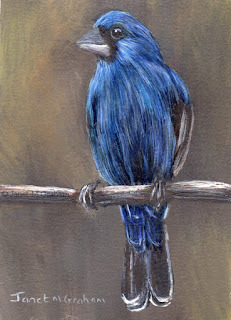 Blue Grosbeaks are found in North and Central America. They measure between 14 - 19 cm in length and weigh between 26 - 32 grams. Blue Grosbeak measures 2.5 x 3.5 inches and is painted on Colourfix Smooth paper. Yellow Grosbeak are found in Western Mexico and Guatemala and few stray into Southern Arizona in the United States. They measure around 24 cm in length and weigh about 62 grams. 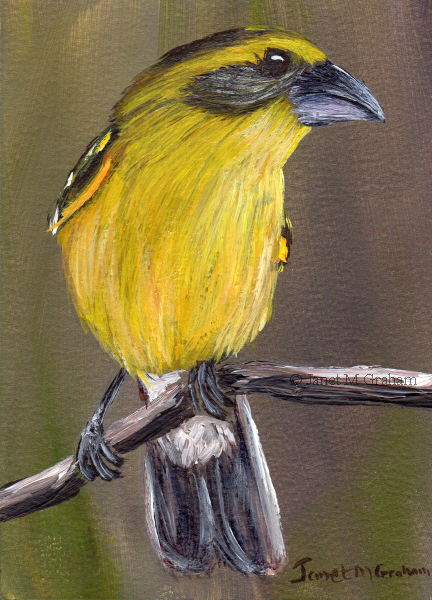 Yellow Grosbeak measures 2.5 x 3.5 inches and is painted on Colourfix Smooth Paper. I love how this little guy is perched on the log. Really pleased with how it turned out. Pale Yellow Robin measures 5 x 5 inches and is painted on Colourfix Smooth Paper. Blue Gray Gnatcatcher measures 5 x 5 inches and is painted on Colourfix Smooth Paper. 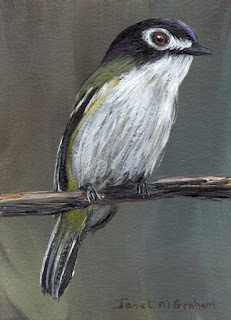 Eastern Wood Pewee measures 2.5 x 3.5 inches and is painted on Colourfix Smooth paper. Cinnamon Becard's are found in Latin America. They measure around 14 cm in length and weigh between 17 - 22 grams. 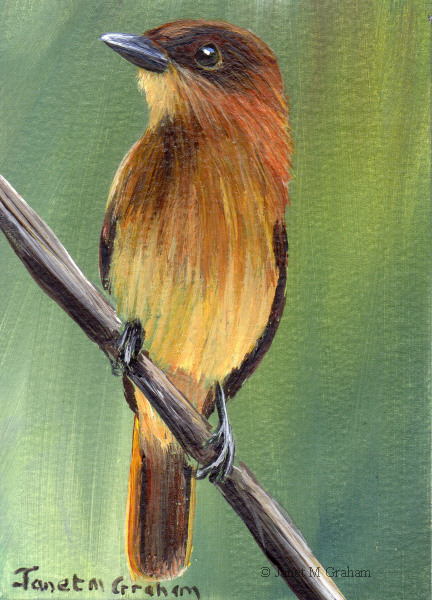 Cinnamon Becard measures 2.5 x 3.5 inches and is painted on Colourfix Smooth paper. I love the vibrant red feathers of the Cardinal. 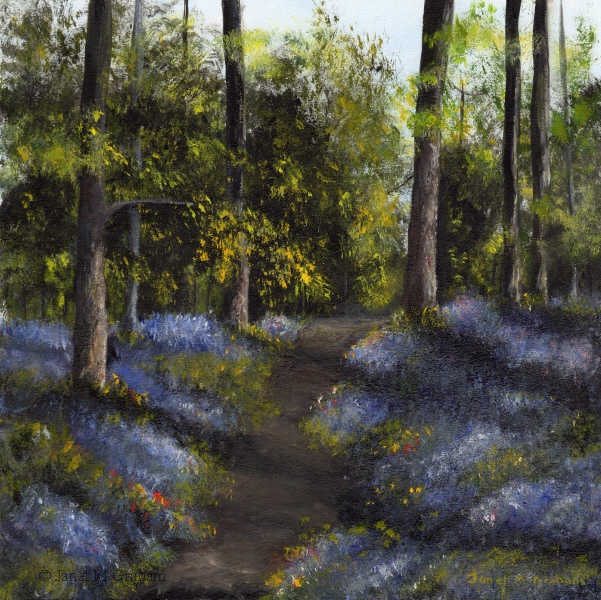 I changed this one a bit when compared to the reference photo by adding in the bluebells. Bluebell Path measures 8 x 8 inches and is painted on Colourfix Smooth paper. Cape May Warbler measures 5 x 5 inches and is painted on Colourfix Smooth paper. Black Capped Vireo measures 2.5 x 3.5 inches and is painted on Colourfix Smooth Paper. 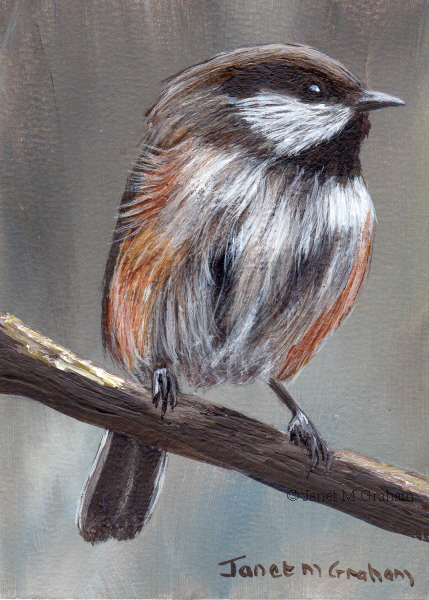 Boreal Chickadee measures 2.5 x 3.5 inches and is painted on Colourfix Smooth Paper. It doesn't feel much like autumn at the moment as it is still rather hot here in Brisbane. 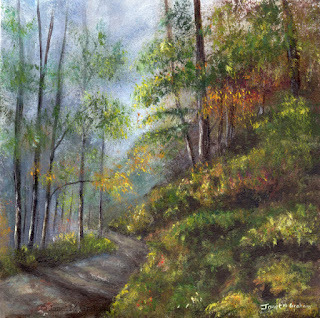 So the next best thing was to paint an Autumn scene instead. Really pleased with how it turned out. Autumn Woodlands measures 8 x 8 inches and is painted on Colourfix Smooth paper. Love how this one is all puffed up. House Finches are native to western North America. They measure between 12.5 - 15 cm in length and weigh between 16 to 27 grams. 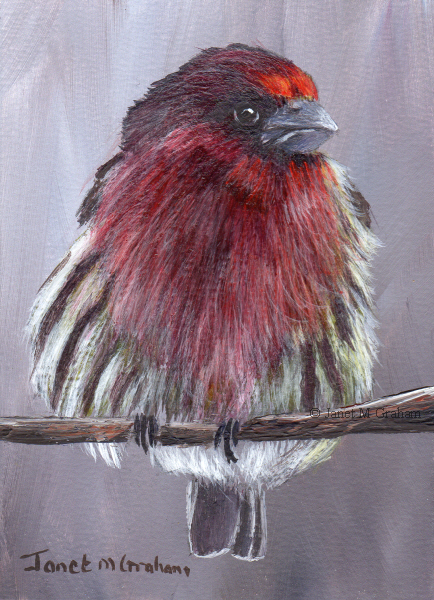 House Finch measures 2.5 x 3.5 inches and is painted on Colourfix Smooth paper. 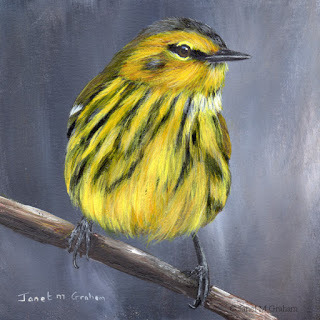 Many thanks to Linda Anderson for the reference photo. 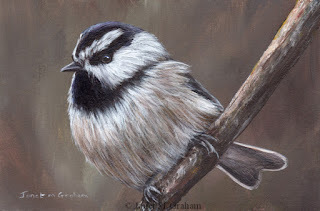 I love the colouring of this one and is different type of beak. 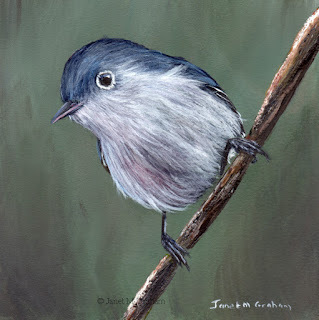 Spot Breasted Parrotbill's are found in China, India, Laos, Myanmar, Thailand, Bangladesh and Vietnam. The measure between 18 - 22 cm in length and weigh between 26 - 40 grams. 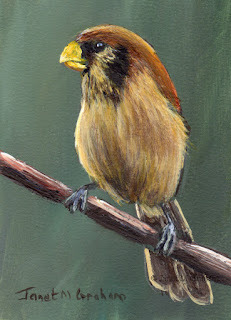 Spot Breasted Parrotbill measures 2.5 x 3.5 inches and is painted on Colourfix Smooth paper. 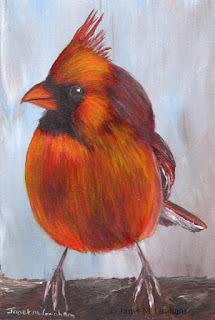 This is another bird that I love to paint. Really pleased with how it turned out. Tufted Titmouse No 10 measures 6 x 4 inches and is painted on Colourfix Smooth paper. Mountain Chickadee No 2 measures 6 x 4 inches and is painted on Colourfix Smooth Paper. 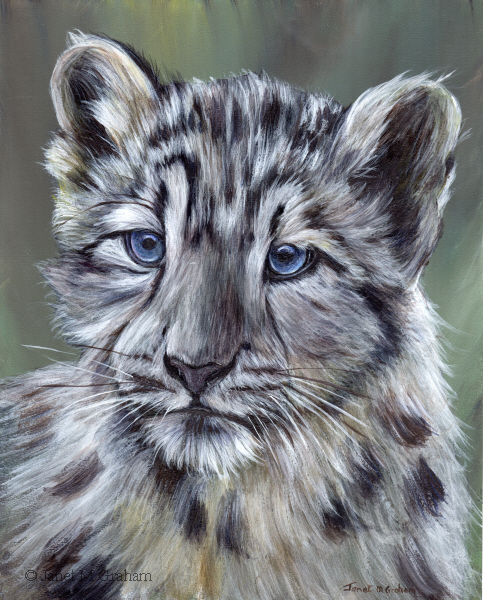 I love this snow leopard cubs blue eyes, Really pleased with how it turned out. Snow Leopard Cub measures 8 x 10 inches and is painted on Colourfix Smooth Paper. 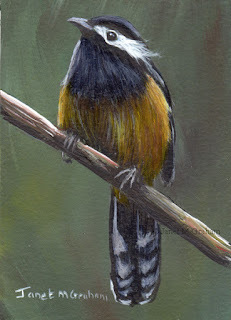 Many thanks to Emmanuel Keller for the reference photo. 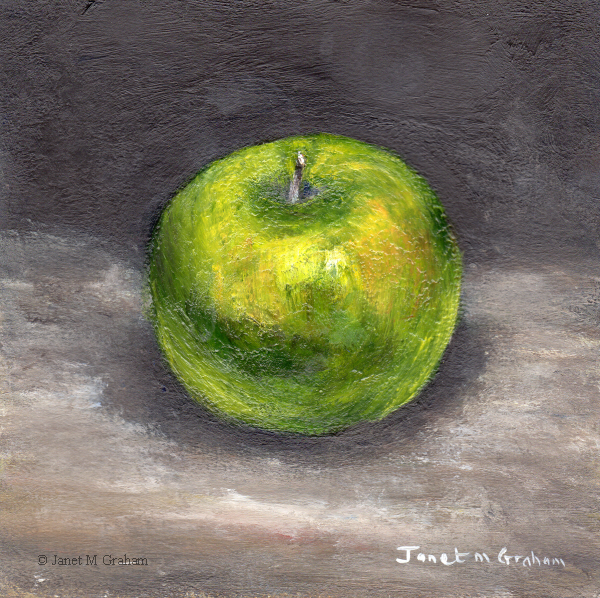 For something a bit different, I decided to paint a still life. Granny Smith Apple measures 5 x 5 inches and is painted on Colourfix Smooth paper. 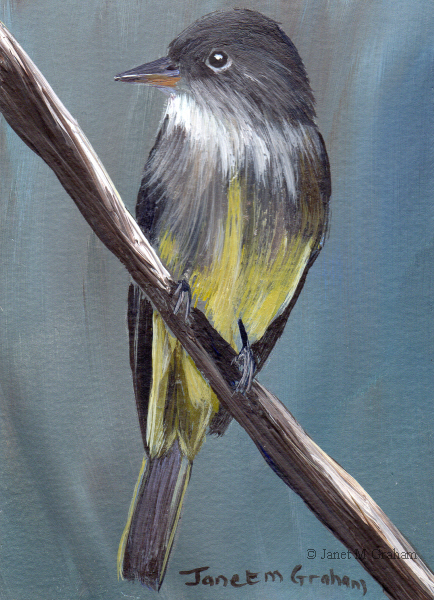 I love how this one is posing on the branch - really pleased with how it turned out. African Stonechat's are found in Sub Saharan Africa. 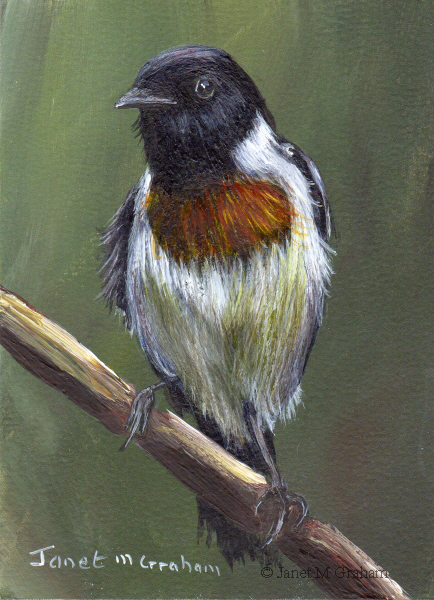 African Stonechat measures 2.5 x 3.5 inches and is painted on Colourfix Smooth Paper. 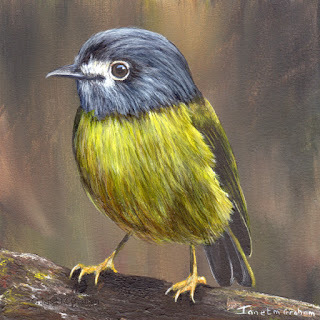 White Eared Sibia's are found in Taiwan. They measure between 22 - 24 cm in length and weigh around 48 grams. White Eared Sibia measures 2.5 x 3.5 inches and is painted on Colourfix Smooth paper.